A new class of micro rotor automatics was released in 1968. Some had calendar complications and some did not. Those with calendar complications were included in the Dateline series and the designation TM was added, representing Thin-o-matic. 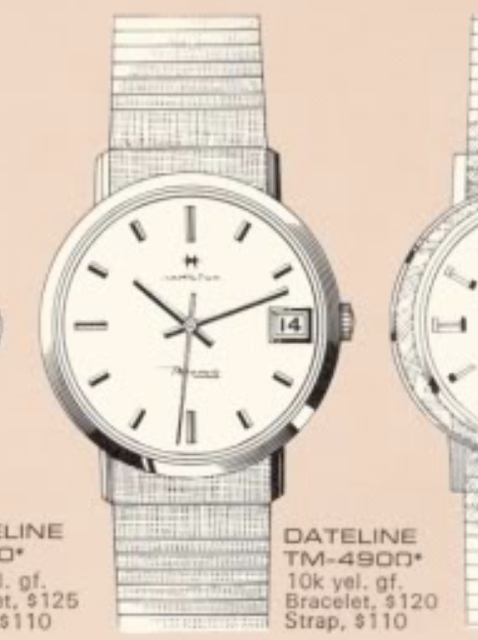 One of the new models was the 1968 Dateline TM-4900. It was produced through 1971. The TM-4900 came in a 10K yellow gold filled one-piece case with either a matching bracelet or on a strap. My project watch has some obvious issues - like the crown doesn't seat on the stem tube. The watch appears to run but the date does not advance. So something is going on under the dial. Some Thin-o-matics have ETA movements with a curved case back. However, a flat case back is a sure sign that there's a micro rotor inside. Uggh... do I really want to tackle one of these movements again? These Buren-made movements utilize an offset center wheel (visible with the silver bushing just left of center). They are notorious for having issues where the movement keeps excellent time but the watch appears to run slow, thanks to the cannon pinion that is integrated into the center wheel design. The oscillating weight on the back of the movement has been rubbing the inside of the case back. In fact, there's now a groove on the inside of the case at the extreme left side. With the movement out of the way, the crown is now fully seated so the female side of the two-piece stem needs to be trimmed a bit for a better fit. The oscillating weight is fully seated but it's wobbly. The framework for it is either worn out or it has another issue. There's some rust on the male-side of the stem and it's started to tone the date wheel at the number 18. Fortunately I have a donor movement. It has some issues too (like it's super-hard to wind) but between the two movements hopefully I can assemble one good one. The calendar complication on this movement is very familiar to some other 1970s models. As the hour wheel turns, it engages a couple of wheels that eventually turn a large golden wheel. As the large wheel turns it will slowly stick out a finger that advances the date wheel counter clockwise. The bottom of the oscillating weight is missing it's pivot... thus the wobble. Fortunately the donor movement has a good part to utilize. Everything is cleaned and readied for reassembly. There are a variety of very small, but different, screws and it's important that they go in the proper places. Well, it took a while... about twice as long as a typical movement, but I got the movement back together and running. Hmm... something is making a little extra noise inside. Could be the hairspring, could be the pallet fork, or it could be both. I suspect it was the pallet fork and eventually I got it to run cleanly. Now I just need to speed it up. Okay - not too shabby. I'll leave it here for now. In order to put the hands back on I need to advance the time until the date changes. I put it back in the case so I can use the crown. Then I can install the hands on at "midnight" so the date will advance at the correct time. The last thing to do is to trim the stem so the crown seats flush. This is actually a different crown, with an H logo, but I still needed to trim the stem. Unfortunately the dial has some speckling, probably thanks to the same moisture that rusted the stem. There's nothing I can do to improve the dial but it doesn't look too terrible. This is a sharp-looking 1960's watch but I still don't have any love for the 2nd generation of micro rotors. I will need to observe the watch to make sure the hands move as they should... if they don't, I'll have to take it apart again and change the center wheel or try to tighten the cannon pinion. Wish me luck! Hey Dan, any updates on how this one is running? Thanks! Sorry for the slow reply... or some reason comment notifications was turned off. Anyway, if I recall correctly I had to take it apart again and tighten the cannon pinion but after that it was fine. Help Me Help the NAWCC!